We are $ew Worth It! Did you catch Molli Sparkles TGIFF post from Friday? I found his post, No Value Does Not Equal Free… It Equals $2,076.65, to be very interesting. I have been following his various posts about his pricing scheme along with the We are $ew Worth It! series at Hunters Design Studio. Where to start? I have been feeling a bit weird about quilting and blogging recently. I have been making and giving away quilts for years, but I am now actively trying to figure out how to make and sell my quilts. I considered myself to be the main income provider in my family… until I left my full time job (yes, that balance shifted and changed over the years, but my mental view of our income and finances put a lot of unnecessary pressure on myself). Now, I am thankful we can cover our bills each month (usually). I love the creative outlet and mental space that quilting provides me, and I try really hard not to promote myself on my blog. I kind of view my blog as a place for me to talk about quilting, the quilting process, sewing, and general creativity. I don’t want my blog readers to think I am trying to market myself or my quilts to them, but the reality is that I am also trying to figure out how to sell my quilts. It seems like a delicate balance. I realized this week that while I am challenging myself and trying to find internal balance with yoga and meditation, that I am not honoring balance in my quilting life because I talk so little about the aspect of trying to make quilts to sell. I do on occasion mention in a blog post that a quilt I am working on has been commissioned or is for a customer. Today, I would like to honor a bit more balance by discussing how I am trying to price my quilts. I realize that this post will not be interesting to some of my blog readers, but I really would welcome community insight and feedback for those of you who do stick around to read this full post. I am trying to be realistic about how I approach making and selling quilts. What does that mean? Well, I try to pick patterns that I know I can complete rather quickly (less time invested = less money). I track the time I put into each quilt (and report that information on my blog! yay for nerdy quilt statistics!). I charge $15/hour for my time, unless I am making quilted placemats. For placemats I tend to charge $7-$10/hour. I also add up my material costs (fabric, thread, batting)… again with the exception being quilted placemats. I try to use fabric in my stash for any placemats I make unless they are commissioned and very specific. If I use fabric from my stash, I charge a much lower price per yard than the current off the bolt fees (typically around $10 – $12/yard for most prints and $7/yard for Kona solids). In the end, placemats are priced as a set at a value I think someone might pay instead of at the market level for fabric and labor. The other factor I add in when considering costs are my sale and shipping fees. Currently, I sell my quilts online through Etsy, and the credit card processing fee and Etsy surcharge amounts to about 6% of the sale. Beyond that, I just try to make sure that the price I list the quilt for is just a bit more than materials + labor + sale charges + shipping (if applicable). A bit more about my decision to charge $15/hour. I have made around 75 quilts (so far), and while I am not the grand high poo-bah master of quilting, I can make a very nice quilt these days. The 4th quilt I ever made, Star Quilt, has held up to very constant use over 14-15 years, and I know that I now use higher quality fabrics, thread, batting, and finer detail in quilting – which just means that the quilts I make are going to hold up and last. Also, I purposefully wanted to set my rate to be a bit higher so that if I found that I could not sell my quilts and wanted to offer a discount or “sale” that I would be able to do so with some margin. OK, so back to Molli’s post from Friday. The quilt he discusses is 72″ by 72″ and it looks like it took him just over 34.5 hours to create. I have been tracking my time spent designing, preparing the fabric (cutting), piecing the top, piecing the back, and binding for about 4 months now. I know that I am on the more speedy side of quilt making, but it also happens to be because I like more modern quilts with larger blocks and negative space, or I am purposefully choosing to not do very intricate work (aka lots of tiny piecing). There is nothing wrong with intricate work; I just expect that unless it was requested by someone, the sticker shock would keep anyone from ever considering purchasing a quilt that I put a *lot* of time into. The quilt top and backing that Molli created is beautiful and intricate, and without a customer requesting the work, it is probably not something I would set out to make on my own. 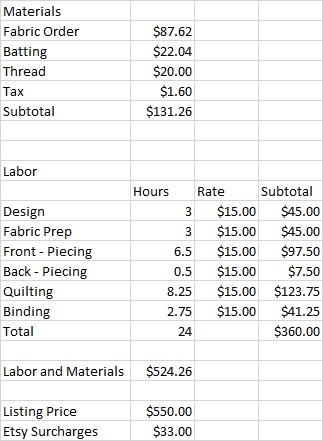 Some interesting statistics that I have found by tracking the “costs” of some of my quilts. *Note that I have found this to be true for me; I expect that everyone’s style and preferences are different! Materials (fabric, batting, thread) account for about 20-25% of the final price of a quilt. This is not always 100% accurate, but it is a very good rule of thumb if I am looking to give an initial cost estimate to someone. The amount of time spent designing, preparing the fabric, and piecing the top is about equivalent to the amount of time I spend piecing the back, basting, quilting, and putting on the binding. Again, this is not always true, but it helps me as a rule of thumb. If I am doing an all over FMQ pattern, this works. For something with more quilting detail and a simpler top, like Namibia Trees, I spent much more time on the quilting than this simple equation would have otherwise implied. So let me show you all the information for a few of my more recent quilts. In the case of Orange Crush pricing (above), the material costs are about 20% of the listing price. It falls on the low end of my estimated range due to the fact that I purchased most of the orange fabric for the top at a steep discount (yay for sales!). The rule of thumb for my time is about consistent. Adding up my design time, fabric prep time, and time spent piecing the front equals 13.5 hours. Adding up my time piecing the backing, quilting, and binding equals 14.5 hours. Note that the Labor and Materials summation also includes the Etsy Fees (set at 6% of the listing price). My goal is to list the quilt above the materials, labor, and fees summation. Also note that Orange Crush finished at 57″ by 57″. For Space Age Tumbling Blocks (above), the material costs are 24% of the listing price. I actually spent much more on the fabric order, but I only charged for the material used from the order. Time for design, fabric prep, and piecing the front adds up to 12.5 hours, and time for piecing the backing, quilting, and binding adds up to 11.5 hours. Again, note in this example that the Labor and Materials summation also includes the Etsy Fees (set at 6% of the listing price). My goal is to list the quilt above the materials, labor, and fees summation. Also note that Space Age Tumbling Blocks finished at 56″ by 68″. In closing, I will say that this works pretty well for me right now, and I have already made adjustments to my rules of thumb. I used to estimate material costs at 33% of listing price, but I have found that I undershoot a cost estimate to customers if I use 33%. Adjusting to 20% for an initial quote has made even rough initial estimates much better and more informative to potential clients. I have been tracking all my costs for the year, and with the sales I have been able to make, I am pretty much breaking even for the year at the moment. I don’t know what happens next or if I will continue to pursue making quilts to sell. I am a work in progress, and I would welcome any insight or feedback from you. I found this post to be really interesting. I haven’t sold a quilt yet; I’ve given them away. Right now I consider it skill building, much like a college class prepares one for graduation and a “real” job. However, I’ve been giving pricing a lot of thought and am wondering how I could ever price a quilt so that it would be a break even proposition for me, let alone a profit producer. I would like to continue making quilts but am at the point where I need a reason to keep investing my time and money. I think showing a customer the breakdown (like the examples you gave) would be eye opening for that person and help overcome any objections they would have to an asking price. I also believe geography has a lot to do with the price one can charge. Very few people in my small town would pay $500 for a small quilt and especially not the more modern ones that I like to create. That’s where a site like Etsy would definitely broaden my market. You’ve written a very thought provoking post Yvonne. Thanks for sharing your process! This is a fascinating topic. Even if a quilter only gives quilts away, it is interesting to ponder the actual value of that gift. $15 an hour sounds very reasonable considering that it is just above the minimum wage, but quilting requires special skills and training. Most people would probably balk at fair pricing since they would expect to pay for the cost of box store fabric alone, making the price similar to a commercial comforter. It is a shame when quilters sell their quilts so low because it makes talented artists who use quality materials barely able to cover their costs if they sell quilts. Personally, I haven’t attempted to sell my quilts because they are either gifts to friends who understand the value of my work or mean more to me than money I might gain. Great post, Yvonne! I’ve been considering and Etsy store for a while, but haven’t actually taken the plunge yet. Maybe soon. I appreciate posts like this that will help me set fair and reasonable prices when I do decide to set up shop. Personally, I think your pricing looks very fair. Imagine the sticker shock of a Dear Jane quilt! No one would sell one anyway, but imagine! Most self-employed forget to cover the costs of holidays and health that a ‘normal’ employee has covered by their employer. Do not forget to factor in ALL your overheads – such as electricity, internet costs, machine servicing and depreciation, as well as consumables like cutting blades – of running your fledgling business from home. I don’t know US pay rates, but minimum wage here is just under $17/hr. Are you allowing for the skill involved in what you do? I think the “skill involved” is why the award wage system works better than aiming for more than minimum wage. Don’t even get me started on Molli’s justifications of $30 hr when only sewing for a couple of years whilst comparing himself to plumbers (who work under minimum wage for 4+ years along with other tradies in apprenticeships to work themselves up to be experienced enough for higher wages). I think the pricing model you have is reasonable and will work great. I’ve always found the topic of pricing quilts interesting. Most people price quilts using a consumer market model, like say Target would. But if you’re calling quilts art then you move into a realm where cost doesn’t always equal value. I could use really expensive paints and techniques to create a painting and spend lots of time on it, but if no one likes my painting then I can never sell it for what to cost me to make. And if I and a well known artist drew the same picture using the exact same materials and time, I’m pretty sure the other artist because of their ‘name’ will be able to charge more. I’m wondering if this could be factored into a quilts price? Like it’s worth more because it’s a better design, more beautiful than anything you’ve ever seen, made by the famous Quilting Jet girl, etc. ;) I think that’s the tricky part. I made a quilt for a co-worker last year and charged only for materials for it. I feel bad that it was so low, but then I also don’t because it was only the second quilt I had ever made, it was motivation to actually complete another quilt, and therefore it gave me more experience. With hours spent on a quilt, I’m also iffy on what happens if you made a mistake? Say you were chain piecing and then ended up putting everything back to front and had to unpick. That’s your fault, not the customer’s, so does that extra time still end up charged to the customer? (I know they wouldn’t actually know you made a mistake if you just count on the extra time, but it just seems so seedy!). The etsy fees are a good point though; I may need to figure those out and add it appropriately to my quilt prices. I loved Molli’s discussion and have been following since the start, though I still can’t figure that extra charge he adds at the end for profit since he’s already making an hourly wage and not paying an employee for labor. But that aside, I’ve started using his breakout sheet to do estimates and final pricing for my customers. It was eye opening to me to see what I have to charge to make any profit (at initially $10/hr and just on latest project bumped myself to $14/hr, though I still have a tendency to underestimate time and sadly have probably averaged much less/hr – I need to be diligent like you and start doing some detailed time tracking). My mom was shocked when I told her what I’d quoted a customer for a baby quilt, but when you look at the numbers, I’m still probably low and am failing to add in something to cover maintenance/utilities. But such is the history of pricing that everyone thinks Target’s bulk sweatshop labor prices should stand as the norm. Looking at Granny Maud’s GIrl’s comment, there are other factors I’m overlooking, too, that should at least be factored in to my hourly rate. Ok, enough about me, though – my point was, a) yes, I like the way MS has brought this forefront and made a lot of us think and change because it needs to happen to sustain small businesses, and b) thanks for sharing you views and some examples, Yvonne – every person who puts this out there is helping all th eother small business craftspeople. Now I think I should do a post on it, too! It always surprises me when you tot it all up how much it costs us at the end of the day to make a quilt, it’s easy to tot up the fabric but our time is precious. What surprised me wasn’t so much Molli’s total but his comparison from AUS to US. Big difference in the overall there. Your target market has a big impact on your selling price too, it was interesting that someone brought up Art Quilts over craft Quilts. I found the info about time quite interesting so keep on addding it 🙂 Good luck with your etsy store! I think this is very reasonable, but still think you should charge more for placemats. 🙂 Whenever someone aske me about a commissioned quilt I always state up front that I charge $15 an hour plus supplies. If they don’t want to pay it, they don’t have to ask me to do it. Luckily, all of my commissions are local, so I don’t have to worry about shipping or other fees. Really interesting post. Starting an Etsy store is something I’m trying to get round to and a) I don’t like to include selling related things in my blog space either and b) I’m rubbish at anything to do with pricing! So it was a very useful post for me!